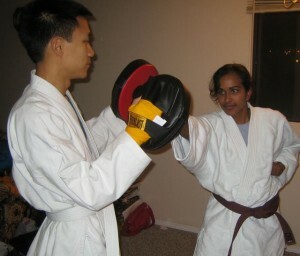 My fiancee and I practicing with the focus mitts. As I sit here planning my own wedding (mere weeks away), I am struck by how planning a wedding is like planning a military campaign. Asides from the possible metaphor of love and war, the planning process between the two share many conceptual similarities. 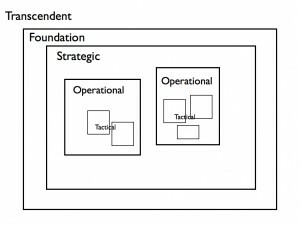 Both involve tactical, operational and strategic framing. Both require you to think about why you are doing this in the first place. And both require well developed capacities to succeed. One of the tremendously helpful constructs from military strategy is looking at a given campaign from different frames of action, a concept developed more fully by the Action Studies Institute. By looking at a wedding from different frames of action (tactical, operational, strategic, foundational, transcendent) I can more effectively make it happen because quite frankly, the human brain is not capable of holding simultaneously all the details around hosting a 200 person party. It allows me to zoom out, look at the big picture, and then zoom back in to make sense of the bits and pieces. What are these frames? Allow me to explain with some direct examples. Most people who have planned events start with the day in mind and then work backwards thinking of all the tasks (tactical level) required to make it happen. Small tasks like getting boutineers and ordering bouquets can be grouped into higher level tasks – ordering flowers. These larger tasks could then become a full fledged operation that could be assigned to a person – the flower “captain” – who would take on the responsibility of ordering, delivering, and setting it up according to the specifications of the mission parameters such as colour scheme or the bride’s preferences. The coordination and interlinking of the various operations (flower person, food person, decoration person) become a part of the strategic frame. You think about higher level objectives. What will be the look and feel of the wedding? How will these various operations be funded and supported? For instance, do I need to train someone on how to run my laptop? Good higher level objectives provide guidance for all operations. As important as supporting and directing the operations is attempting to anticipate critical problems both external and internal to the “team”. While it’s always possible that vendors may fail to follow through (what? no food for guests? ), the stress on family members may be such that they will not be able to address the issue. The strategic frame is not just about anticipating every possible problem, but developing the capacity to handle unanticipated problems. When you pair an open bar with a party, well, you simply have to accept that unexpected things will arise! Thinking at the strategic level does not come naturally. As human beings, we are far more inclined to focus on the immediate needs and tasks. Our inclination is to get tactical. We are far less inclined to step back and work on the bigger picture. In business, we focus on execution. In addressing complex social issues, we jump to action. Rarely do we step back and ask whether what we are doing is helpful. Even more difficult than thinking at the strategic level is thinking at the foundational level. This is the level of asking what this mission is for in the first place. Much like a couple asking themselves why they’re getting married in the first place, the discussion could be explosive because it challenges fundamental assumptions – why do you love me again? And yet, it is such a critical question because all the planning and strategizing means little if the foundation has not been well-formed. We could return to the occupation of Iraq by the US and see that not only was their strategy flawed (shock and awe for a “quick” war), but the reasons and purpose for the mission was based on a false premise (no WMDs or proven links to Al-Qaeda). Why don’t we spend the time to test our foundational frame? Part of the reason is that we don’t want to face the fact that our cherished values and beliefs might be misguided, distorted, or plain wrong. Who wants that? The other reason is also a weak understanding of what humanity and life is all about (the transcendent frame). Without an understanding of the human story, our understanding of ourselves and others are likely to be limited. If life is in fact all about looking good and achieving status, then marriage will serve one sort of purpose. If life is a process of becoming a better human being, then marriage would serve another broader purpose. The study of life and wisdom is a life-long journey as repeatedly preached to us by the sages of the world. Each of these frames interact with each other in interesting and dynamic ways. Each requires its own sets of capacities and ways of thinking. War or love, business or life… all can benefit from developing strong frames. Granted, a military campaign differs from wedding planning in that there are higher levels of uncertainty with opponents who are generally invested in killing you. On the other hand getting together a big multicultural family together for the first time has it’s own adaptive challenges! I know that in a few more days, my conscious mind will be consumed by the operational details of making the wedding happen, but I hope that both my fiancee and I will be able to remember what this is all about and why we’re on this life journey together in the midst of the biggest party we’ll probably ever have. The wedding may go nothing like we expect, but our life will continue to flourish regardless. I think one of life’s greatest challenge is to find true love between two people. Now, you two have found it. Congradulation!! It’s the vow that you two take and the love that you two see when you two look into each other’s eyes that are the most important. All the other stuffs are just secondary. Enjoy those moments and treasure them for ever. Congratulation on your upcoming marriage. There’s nothing like being married. When it’s going good there’s nothing like it. When it’s going less than good, there’s nothing like it. What you work at in life works. Marriage is worth working at. All the best for your wedding, I am sure it will be fantastic! I’ll be in Canada for 2 weeks arriving 16th August, suspect you will be very busy with the wedding but if you two wanted to meet up for coffee one day do let me know. Otherwise all the best for your marriage, it is so nice to see you have found each other congratulations. Previous PostPrevious What is Canada? • Exponentially increasing amounts of knowledge and information. • Over-reliance on specialists, experts, and institutions for our learning. • Complexity of systemic issues we face everyday. The Solution:To learn how to integrate multiple fields of study, to draw lessons from everyday life, and to face the complexity of the problem. U Venture strives make meaning out of the complex and to help find better ways forward for society.